It’s been a while since I cast my eye on Kirkland’s McLeod Project, announcing the closure of the posh Peruvian restaurant Mixtura and plans to wreck and displace a host of longer-lived restaurant and retail spaces in its orbit. Well, the dust has since settled, and developer Stuart McLeod and his restaurant team expect to open Milagro Cantina — an 8,000-square-foot addition to downtown Kirkland’s dining scene — in mid-Demember. 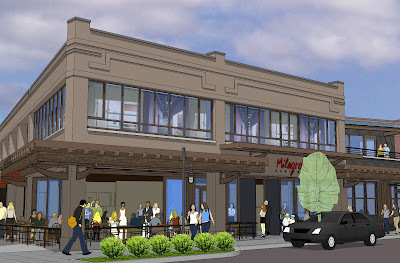 Milagro, rendered as a fussy “cantina” in the re-envisioned site of the former Kirkland Waterfront Market. Built as a more sophisticated setting than its sibling-restaurant Hector’s, Milagro houses an 80-seat dining room, 60-seat bar, large private dining area and a 10-seat “Chef’s Table” — a semi-private space hung with a glass pinata imported from Guadalajara. Pin your tail to your seat, pass the platillos pequenos, but once you’ve had your fill of top-shelf tequila, no batting practice, OK? An outdoor patio with a Lake Washington view is set to accommodate an additional 100 guests, and its heated awnings and gas-fueled fire-pits are meant to keep you and your friend Al Fresco cozy seven months out of the year (good luck with that!). Meanwhile, indoors, a fire-pit in the bar, radiant-heat floors and colorful hand-crafted lanterns — like these, hanging in the main dining room — should help warm things up. Oh-oh-oh, Mexico. I’ve never really been, but I’d sure like to go. That’s what he said. Taking charge of operations is Jason Harris, former food and beverage manager at Seattle’s Hotel 1000. And overseeing Milagro’s menu is executive chef Chris Peterson, former chef-exec at Bellevue’s Bis on Main, who spent four years in the kitchen at Cafe Campagne prior to decamping to the Eastside. 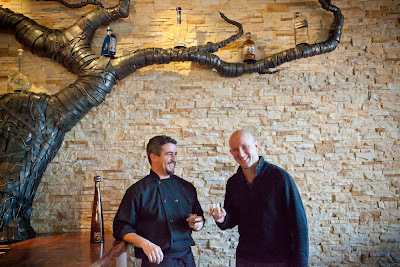 Chef Chris Peterson (left) and GM Jason Harris lift one at the bar at Milagro Cantina where a forged-steel “Tequila Tree” stands (7-feet) tall. Peterson has spent several months developing a menu meant to make good use of Northwest ingredients while covering the Mexican map. Expect Oaxacan moles, Sonoran-styled grilled meats, seafood recipes from Baja and the kind of “street-food” you might find in Mexico City. Once the Milagro website goes live, you can check out the full menu. And, yes: the words tacos, tortas, enchiladas and quesadillas will be invoked. Scheduled hours are 11 a.m.-11 p.m. Sundays through Thursdays and 11 a.m.-midnight Fridays and Saturdays.